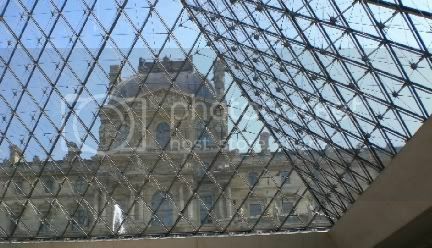 Well, I don't think you can go to Paris without stopping by the Louvre. Certainly you can't if you are with the Mysterious Chinese Woman and here Equally Mysterious Sister. And so, stop by we did. Not that we didn't have a bit of trouble finding it. 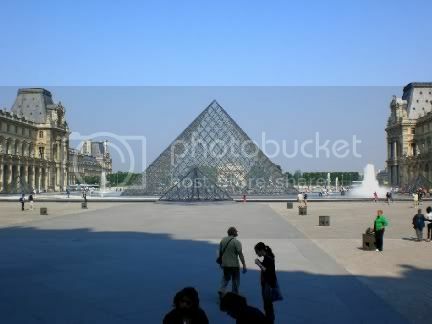 My memory from the last time I was here, in 1998, was just of the glass pyramid. I guess I forgot it was inside a courtyard and pretty much hidden from sight from outside. 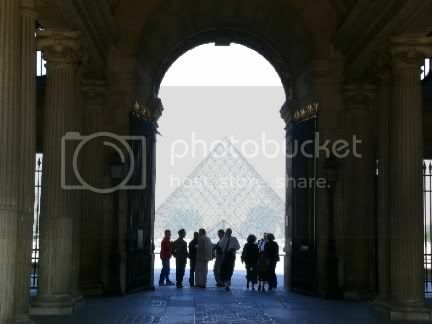 However, once you get up to the archway to the courtyard the pyramid does loom into view. 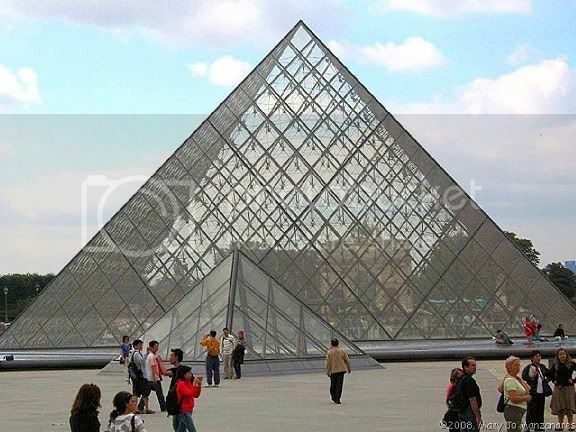 The glass pyramid is the entrance to the museum and it is surrounded by fountains and four smaller glass pyramids. A bit surrealistic given that it is also surrounded by centuries old stonework, but quite pleasant. I also found the views from just inside looking up, after taking the escalator down, to be quite interesting as well. I won't bore you with a lot of pictures of the exhibits, you can find them all over if you are interested. Here are a few though of the most famous of the exhibits, though. 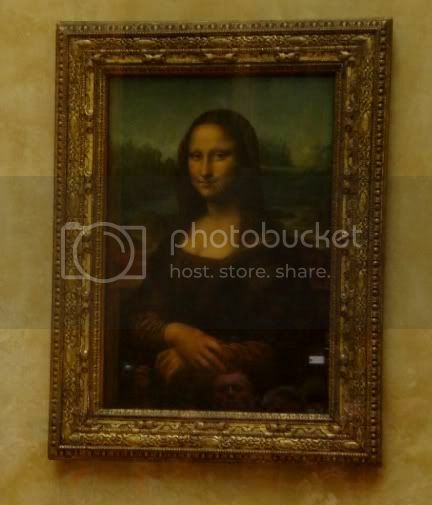 Most people, when seeing the Mona Lisa for the first time, are surprised by how small it is. It only is 21 inches wide and 30 inches long and still, arguably, the most famous painting in the world. What few people know is that Leonardo da Vinci painted this picture relatively late in his life and carried it around with him until he died. Supposedly, he never thought it was really finished and continued to work on it right up until the end. At least this is what I have heard, probably on the History Channel. 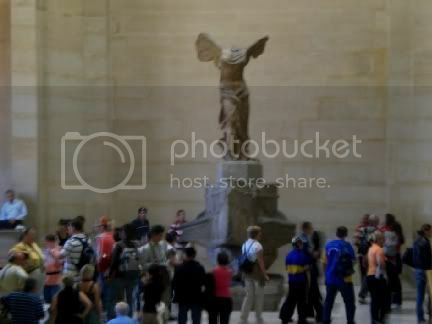 As an aside, isn't it interesting that they let you take pictures in the Louvre, but not in Balthazar? 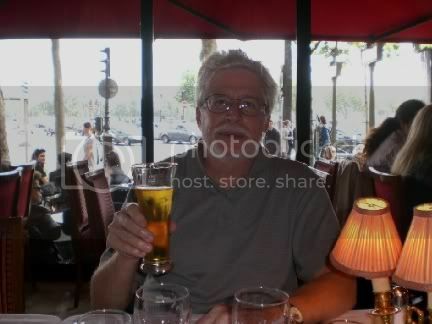 For those of you revisiting this post, you may notice that I have removed the pictures of me having a beer after visiting the museum. 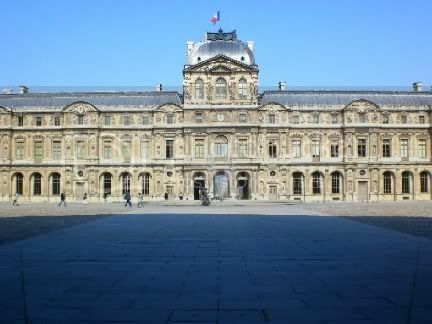 That is because that bar was nowhere near the Louvre and I went there on a different day. My bad. You will see the pictures again in a future post, however. Well, I am back. Got back on the 17th but it took me until today to pretty much recover from the long plane ride. Also, the Mysterious Chinese Woman's Equally Mysterious Sister stayed until last night. Another Somewhat Mysterious Sister came over to pick her up and before they left we went to Queen, a very nice Italian restaurant in my neighborhood. Just can't get enough of that Italian food. I will put off writing about that restaurant until another time though because I know you can hardly wait to hear about my trip. Hey, at least you can just close this page so it won't be as painful as having to sit through a slide show. We flew out of JFK in New York on Iberia Airline. 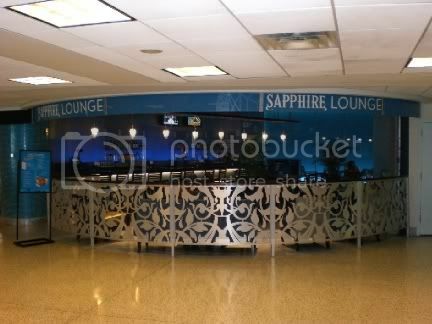 The departure terminal had a very classy cocktail bar, Sapphire. When I popped in it was still empty so I wasn't sure if it was open, even though it was late on a Saturday afternoon. That was probably because it is not an easy place to find. The terminal isn't that large, but the bar is tucked all the way at one end and you can't even see it as you are walking towards it. You have to kind of turn a bit of a corner before it pops into view. Also, there weren't any signs indicating that it was there. Apparently, whoever it is that decides this things wouldn't allow the bar to put up any signs. Quite unusual, if you ask me. Those without a well developed nose for bars might never even find the place. 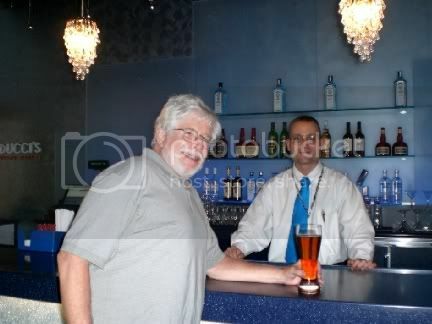 A real shame too because it is one of the nicest airport bars that I have ever visited. They had the usual limited selection of beers and hard liquor but they did have Samuel Adams on tap and for only $3 more you could accompany that with a nice sized shot of whatever they had to pour. Knob Creek, a Kentucky bourbon that has been aged 9 years, in my case. Our departure time was 7:00 PM so I figured I would knock back a couple of beers and shots and then, hopefully, sleep for most of the flight to Madrid where we would change planes for Paris. That kind of worked, but it was more like a series of catnaps than an actual sleep. The free Cava, a Spanish bubbly, that they served on the flight helped things along though. 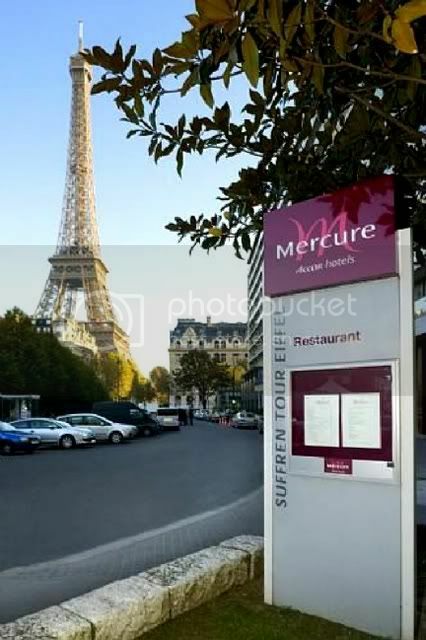 In Paris we stayed at the Mercure Tour Eiffel Suffren, a nice enough hotel that was in a perfect location. 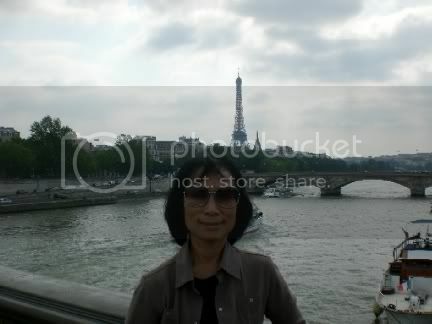 As you might imagine from the name, it was very close to the Eiffel Tower. I think you might once have been able to actually see the Eiffel Tower from some of the hotel's rooms, but there is what looks to be a new Hilton Hotel next door now that appears to effectively block the view. At best I would guess that only a few of the upper rooms at one end of the hotel might have a view. The hotel had an elevator system unlike anything I have ever seen before. What is confusing is that this is on the outside of the elevator bank, not inside the elevator. 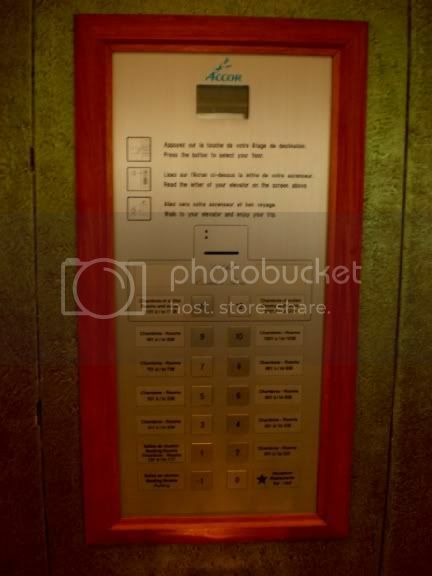 You push the button for the floor you wish to go to and then a screen indicates which of the three elevators to take. There are no buttons inside the elevator so if you change your mind about where you want to go you have to get out and try again. Also, the screen that indicates which elevator to take doesn't stay lit all that long so if you don't watch carefully and more than one elevator shows up at the same time you may find yourself on the wrong one. There is a little panel on the side of the elevator door that indicates the floors it will stop at, but it takes awhile before you notice it. I am not sure what the purpose of this design is, but I guess there must be one. It seemed to confuse everyone the first few times they used the elevator though. 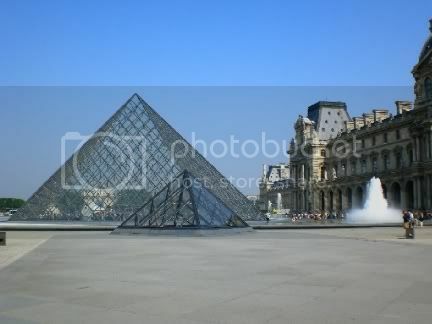 Of course, given the hotel's location, the first thing we had to do was to take pictures of what is probably the most recognizable monument in the entire world. 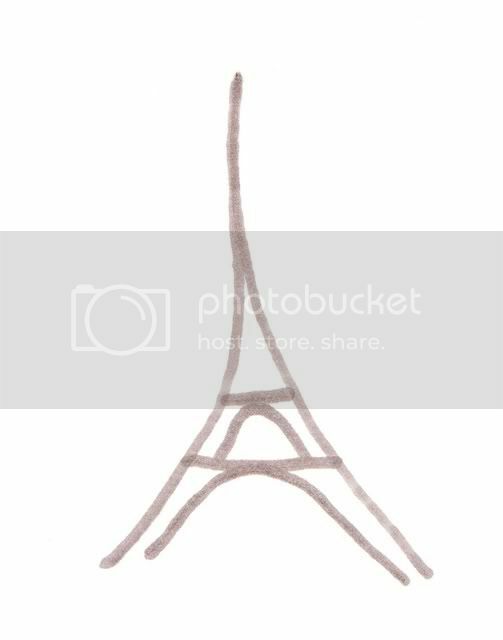 Well, I bet it is certainly the most recognizable monument that a kindergartner can sketch with just a few simple lines. Not to bore you with too many facts, but the Eiffel Tower was not very well received when it was first erected, and erected is the operable word. 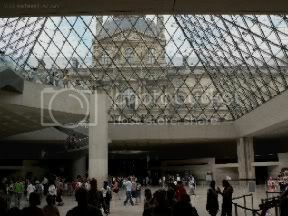 All of the pieces were manufactured outside of Paris and then it was assembled like a giant Erector Set. It was considered grotesque and out of place and people were only placated a bit with the assurance that it would be torn down after twenty years. 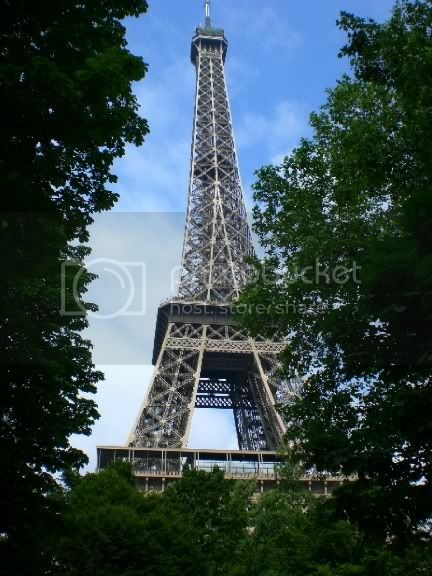 It was built for the 1899 World's Fair and was the tallest building in the world when it went up. It remained the tallest building until 1930 when the Chrysler Building in New York City passed it by. Another piece of trivia. It used to be painted once every seven years but with increasing pollution and the affect of the resultant acidic rain it now has to be painted every five years. It takes fifty tons of paint to cover it. There always seems to be a carnival-like atmosphere underneath the tower with people queuing up for an elevator ride, buying ice-cream and cotton candy and souvenir key chains and just generally having a good old time. 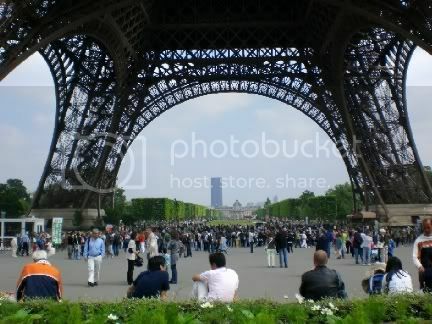 The Eiffel Tower, although it can't be seen from everywhere, can be seen from just about everywhere. It is right by the Seine and one of the several bridges that crosses the river. Another nice thing about where our hotel was located was that it was close to two subway stops. The subway system in Paris is really quite nice and takes you pretty much everywhere in the city. It is really clean too, not a bit of litter on the tracks even. But then the whole city is very clean. Unlike in New York City, people actually seem to use the trash receptacles. You also don't see people eating on the streets or in the subways like you do here. Instead they sit at the little cafes that are everywhere and sip their coffee or drink their wine or beer and have a little bite to eat. Quite civilized. Also, although almost everything in Europe is quite expensive, especially so with the collapse of the dollar against almost all other major currencies, the subway is cheaper than in New York City. A book of ten tickets costs 11.10 Euros and at the current exchange rate that works out to about $1.70 a ride. You can also transfer between the subway and buses, just like you can do here. Also, unlike in New York City they, actually have signs that tell you when the next train will arrive, and they work. They tried to install such a system here, but they pulled the plug on it after spending who knows how much money because they could never get it to work right. But then in New York City the subway cars don't even always run on the same lines they are programmed for so the maps and announcements often don't match up to the stops either. On the other hand, they do run all night whereas the trains in Paris stop around midnight. After walking around a bit and doing some exploring I was grateful when everyone was ready to stop for a bite to eat and I could get a beer. As you can see, it was quite crowded outside but we got a little table inside that was almost outside and I had my first beer in Paris, a Heineken. 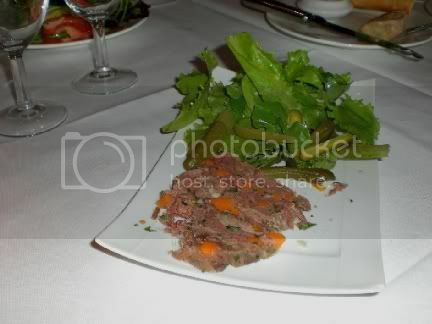 I also had a bit of pate which you can still eat in Paris without feeling guilty. In the small world department, our waitress asked where we were from and when I said New York City she said she had just been there working in a restaurant in the SoHo area. I forgot which one though. I would have chatted with her more but she was quite busy breaking in a new waitress. As you can imagine, I have oodles more to post about my trip but I will stretch it out over several days so you don't get too overwhelmed. One thing I will say though, if people say that the French don't like Americans and are rude to them, don't believe it. I found the people to be, except for one either rude or inept waiter who was reprimanded by his boss, extremely pleasant and very helpful if you had a question. I suspect that those who experience rude behavior somehow bring it on themselves by acting like boors and then blame it on anti-Americanism. My French is limited to Bon Jour and Merci, but you would be surprised how far that will get you. Just a quick post, rates for internet service are still high, although not as high as in Paris. 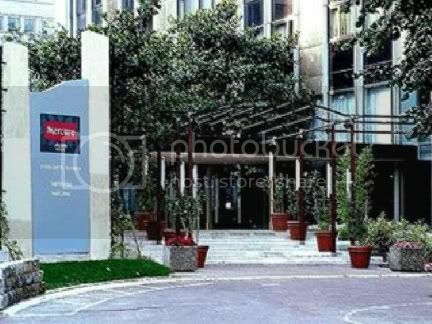 I did see an internet cafe here though, but I am doing this from the hotel. It is a nice hotel, but do not order room service. The Equally Mysterious Sister-In-Law felt a bit under the weather last night. She blamed it on the mushroom pizza she had for lunch, although both the Mysterious Chinese Woman and I shared it and felt fine. 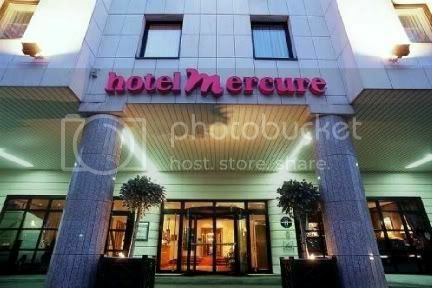 She stayed home and ordered a bowl of soup from room service and it cost her 18 Euros or a bit over $25. So far I have not had a real good meal here in Rome. The first night we went out with the tour group and had a pretty good meal but way over priced at about $75 a person. But that did include a guitar player who sang at our tables in a somewhat entertaining way and waiters who pretended to drop the plates and glasses when they served you. Plenty of food though and free wine. Like I said, good, but over-priced. Last night the Mysterious Chinese Woman and I took a hotel shuttle to a subway stop and then took the subway to what turned out to be a pretty touristy area. 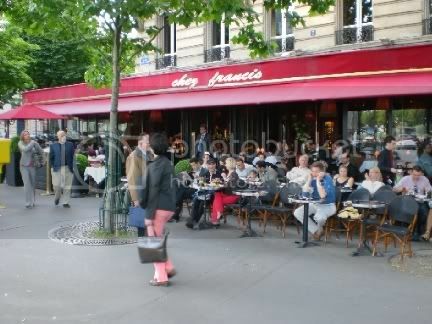 We ate in a neat glass enclosed sidewalk cafe that was very pretty and a great place to watch the passing scene. The service was very friendly as well. Sadly, once again, the food was really quite bad. Well, maybe not bad, but certainly less than one might expect. The only real good part was the pistachio ice cream and the after dinner Irish coffee. Prices are even higher here in Rome than I imagined. Even the stuff they sell on televison that is the same as what you can buy in the United States is about three times as expensive. 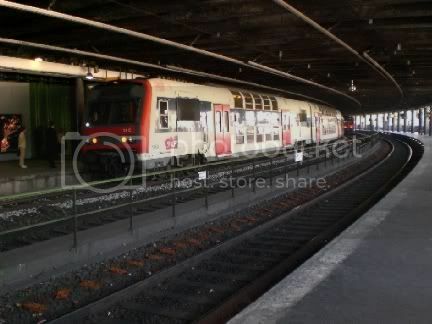 However, in both Paris and Rome the subway fares are less than in New York and the subways are much better maintained. No litter on the tracks, the cars are clean as are the stations. And you can see how long it will be before the next train arrives. Quite nice. I found out why we will probably never have great masters in the arts like they had in the past. Blame it on child labor laws. Many of the great works on display were produced by artists while they were still very young, in their twenties. 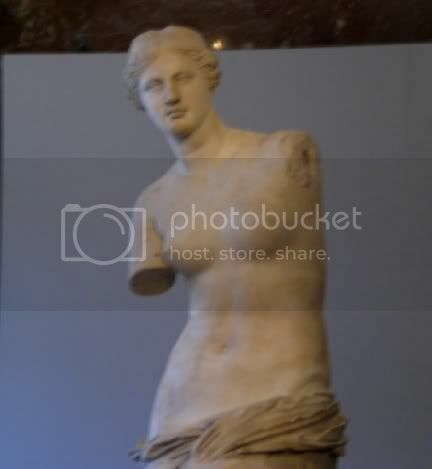 Michelangelo produced his first, and most famous, marble statue of the Piete while still in his early twenties. But then he began his apprenticeship at the age of thirteen. We visited the Sistine Chapel and it was quite impressive. I found it amusing that periodically they would announce, in several languages and over loudspeakers, that visitors should respect the sanctity of the chapel to remain quite. Hmm, not only was that a bit incongrouous, but nobody seemed to think charging tourists admission to enter the chapel and then selling overpriced postcards, books, rosaries, calendars, watches all over the place was not the least bit out of place. No bingo games though, or at least none that I saw. You could take pictures in most of the Vatican, but not in the Sistine Chapel. We were informed that you could do so until recently. The policy was changed, or so we told, when a Japanese firm paid for the complete cleaning and restoration of the Sistine Chapel. In return, apparently, they got the concession rights to the sale of the aforementioned postcards, postcards, calendars, etc. Apparently, by not allowing anyone to take pictures they can sell more of these souveniers. Ah, but keep your voices down. I have not been able to find out how to use the spell checker so please excuse any spelling errors in the last two posts. I will make corrections when I return home in a couple of days. This will be my last post until then, but after I get back I will be able to add pictures, and I have plenty. Most of them look kind of like cheap postcards though. Oh, just one final comment. I do believe I could comfortably live in Paris. Easy to get around, just a generally nice place. Rome, on the other hand, is totally different. Not that the people are not friendly, they are. It is just too hectic and the number of tourists in respect to the size of the city is overwhelming. I do hope to find a less touristy area for dinner tonight.